I remember Slim Jim from Roker Park in the mid 1960’s. Together with former Hibees Centre Forward, Neil Martin, they were 2 of the leading lights of Sunderland’s scots imports. Baxter is still spoken about today in the red and white part of the North East. Quite simply he was the best player I have ever seen. I cried the day he was transferred to Forest and shortly after Baxter and martin’s departures well Sunderland were relegated. Thanks for your memories Neill. it seems Jim left a similar legacy wherever he went. Just a breathtaking talent. Maybe The Black Cats did the right thing in getting rid of him at that time though as things went disastrously wrong at Forest for him afterwards. Being a Hibs fan I remember Neil Martin well too. Of course he played here at Forest also when he was getting a bit older. A ‘proper’ centre forward – you’ll not find many Hibbies with anything bad to say about Neil Martin either. Good luck to Sunderland for the coming season. Always a team I like to see do well. Some of the best fans too. Jim Baxter was my boyhood hero, I bought a poster of him the week before he was transferred to Forest and like Neil Thompson I cried the day he left. Never missed a penalty for us and was an absolute joy to watch. We always said “when Baxter plays well, Sunderland play well”. Absolute GENIUS. He was a master, Pete. It’s criminal to think how the memory of his play is often ignored nowadays – but not by those of us who saw him caress and stroke that football. The man was a genus, and I don’t use that term lightly. i remember when i was a young boy watching jim playing for rangers and scotland , he was my boyhood hero. so when he left sunderland and came to nottingham forest my local team i was elated. what a loss football when he retired at 31, R.I.P JIM. He was some player, John. It’s a pity he wasn’t at his best at the City Ground. Still some glimpses of his awesome talent though. Hi Stuart………….. 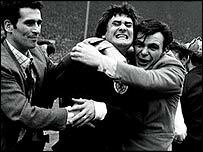 I am writing a biography on Jim Baxter and would love your input Stuart. Hi Tom. Jim was a hero of mine, I’d be glad to help if I can. Best of luck with the biography. Slim Jim was one of a kind. I used to watch him playing for Rangers and Scotland in the sixties. I moved to U.S.A.from Scotland in 1965 and subsequently coached youngsters for 12 years. One of my team asked me once who my favourite player was. I had never been asked that before, but when pondering my answer, I realized there was only one obvious response. One while at university, I had a summer job working on a farm near Dunfermline. I went to a dance one night, and here was Slim Jim, looking very dapper in a mustard coloured Italian siut, with girls mobbing him. Great stories! Thanks very much, Alan. Jim was certainly a one-off wasn’t he. I can understand entirely why he would be anybody’s favourite player, such panache and style. The way that Job stroked the ball around was just inimitable. ‘Flair’ is a much overused word these days in relation to football but Jim encompassed it. What a player!